James K. Jones, who answers to “Jim” with most everybody and “Jimmy” to those who knew him as a child, lives with his wife of 41 years, Dee Dee, in Camarillo, California. His parents claim that he was conceived in a train’s Pullman Berth on their honeymoon and that’s why he’s been travelling ever since. 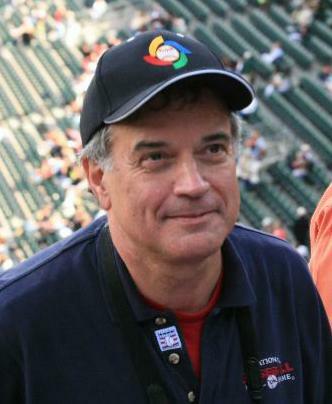 Jim grew up in Chicago and Northern California (Chico and Napa) while developing an abiding love for baseball. In a 33-year career as an electronics engineer, he became an expert in testing and evaluating complex weapon systems and earned the highest civilian award at his 2,000-employee-plus facility for his significant contribution in developing two major Navy systems. After retiring from that job in 2001, Jim began working part-time as an engineering consultant and full-time in pursuing his lifetime dream of seeing every major league ballpark in America and writing about his experiences. As Jim’s dad says, “Folks like to talk to Jim.” Thus, three books with fans reminiscing about baseball with Jim while he continues to hit the road are so appropriate. His third book in the series chronicles his travels in 2007 in which he also saw games at minor league ballparks. You can follow his continuing adventures and reach Jim through his web site www.ballparksacrossamerica.com.